• Removal wrinkles around the eyes (crowfeet), forehead, eyebrows, nose and chin. The procedure takes a few minutes, and is essentially painless. The effects are last for 5 to 6 months. Wrinkles are common creases in the skin that arises either due to frowning or ageing. There are two types of wrinkles: static and dynamic wrinkles. Dynamic wrinkles are those that are formed when expressing emotions. Static wrinkles on the other hand are present at all times. Fillers or fat grafting are the most appropriate for treating static wrinkles. The most responsive non-surgical treatment for dynamic wrinkle is FACE REJUVENATION. The muscles that cause the dynamic wrinkles are relaxed using FACE REJUVENATION. Although its use can be dated back to 1980, the commercial use started in 1989. The formal approval of this injection came on 15th April 2002. From then on, it has been widely used. FACE REJUVENATION injections are of 8 types. 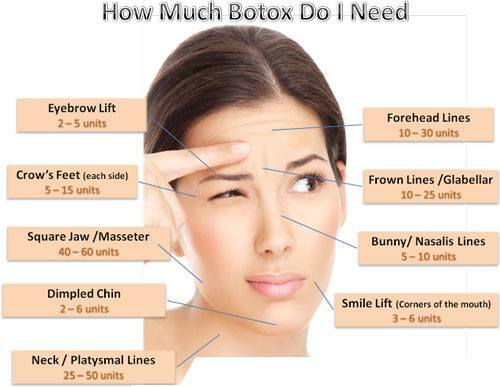 They are A, B, C1, C2, D, E, F, and G. Among these, the botulinum toxin A are B are the most commonly used type of this injection. FACE REJUVENATION, manufactured by Allergan, is widely available in India and is also the most commercially used form of injection worldwide. FACE REJUVENATION functions by facilitating muscle relaxation and arresting muscle stimulation. These functions are done by stopping the release of acetylcholine from the end of nerves. The absorption of FACE REJUVENATION is asymmetrical. The action of this injection is temporary, with the effect seen for almost 5 to 6 months. How is FACE REJUVENATION administered? procedure Delhi may also be used for treating hyperhidrosis. It is a condition of profuse sweating in the palms and underarms. The cost of a FACE REJUVENATION session may vary from INR 5,000 to INR 20,000. LASER is the acronym of Light Amplification through Stimulated Emission of Radiation. Lasers are monochromatic light beams. By monochromatic, we mean any light source having the same wavelength. A light of a certain wavelength is related to a specific colour. Thus, a particular laser has a colour that is constant throughout. Another light source known as IPL (Intense Pulsed Light) is similar to laser, although not the same. IPL radiates light of different wavelengths and hence different colours. Some people regard IPL as the ‘king of all trades’. Nd:YAG (neodymium-doped yttrium aluminum garnet) laser, Diode laser, IPL, etc., are used for hair reduction. All these kinds of lasers have their pros and cons. The most appropriate laser must be chosen based on the individual’s requirement. Since the wavelength of diode laser closely matches with the wavelength of melanin, hair follicle pigment, etc., diode lasers are the most commonly used form of laser for this purpose. Nd: YAG laser, on the other hand, leaves a lot of fine hair behind. IPL is believed by plastic surgeons to be most appropriate laser for hair treatment. An infrared laser is used for SHR (Super Hair Removal). The laser delivers no pain and is very fast. However, long-term effects need to be confirmed. PIXEL lasers are used for acne scar treatment, improvement in facial skin quality, old scar treatment, etc. Facial rejuvenation can also be done effectively using this laser. It results in facial tightening, facial glow, etc. Q-switched laser is used for the removal of tattoo while the long-pulsed Nd:YAG laser is normally employed for pigmentation and birthmarks. Different lasers have different characteristics. Therefore, the side-effects of the laser may also be different. It is required to understand all the effects of the laser prior to treatment. Other queries like cost of procedure, number of sittings required, recovery period, etc., should be clarified with the concerned doctor. Some may offer certain packages at a very cheap rate. However, the effects of these procedures may exist only for a short term. This is just an individual opinion and this cannot be regarded as a medical reference. For producing millions of pixellate burns, a non-ablative laser like the PIXEL laser is employed. A grid pattern is produced when this laser leaves the intervening normal areas. This doesn’t involve any scar and the rate of healing is also very high. The procedure does not involve any pain and hence comfortable. The need of simultaneous skin cooling is also eliminated by the use of PIXEL laser. 2. Acne and chickenpox pits. 3. Treating of small areas of hyperpigmentation. 4. Quick facial before a social function. 5. Improvement of scars anywhere in the body. When PIXEL lasers are used, sunlight is to be avoided for 4 to 5 days. For this purpose, sunscreen should be used for 4 to 6 hours. For normal skin, SPF 26 may be sufficient. For fair skin, SPF of higher numbers may be necessary. For skin that is oily or prone to acne, SPF 15 may be administered. It takes about 4 to 5 days for peeling to occur when PIXEL laser is applied. After this procedure, soft and fresh skin will appear, thereby replacing the overlying dead skin. For best effects, it is advised to take 3 to 4 sessions of PIXEL laser after every 3 to 4 weeks.